There continues to be much bluster out there in ed reform that money really isn’t all that important – especially for traditional public school districts. That local public schools and districts already have way too much money but use it so inefficiently that any additional dollar would necessarily be wasted. An extension of this line of reasoning is that therefore differences in spending across districts are also inconsequential. Much of this bluster about the irrelevance of funding is strangely juxtaposed with arguments that inequity of teacher quality and the adequacy of the quality of the teacher workforce are the major threats to our education system. But of course, these threats have little or nothing to do with money? Right? As I’ve explained previously – equitable distribution of quality teaching requires equitable (not necessarily equal) distribution of resources. Districts serving more needy student populations require smaller classes and more intensive supports if their students are expected to close the gap with their more advantaged peers – or strive for common outcome goals. Even recruiting similarly qualified teachers in higher need settings requires higher, not the same or lower compensation. Districts serving high need populations require a) more staff – more specialized, more diverse and even more of the same (core classroom teacher) staff, of b) at least equal qualifications. That means they need more money (than their more advantaged neighbors) to get the job done. If they so happen to have substantially less money, it’s not a matter of simply trading off those lower class sizes for higher salaries or vice versa. If you have neither, you can’t do the tradeoff. So then, what does funding inequality actually look like? And does funding inequality really translate to inequality of teacher wages? Or inequality of staffing ratios? Figure 1 displays a classic spatial pattern of inequality. Chicago, Illinois, has relatively low per-pupil revenue but is surrounded by leafy suburbs with high-spending public school systems. This is one of those classic “savage inequality” patterns that many like to argue are a thing of the past – an issue already resolved. Background shading indicates state and local revenue per pupil of school districts. Circles indicate schools, with shares of low-income children indicated by the circle’s color. Savage disparities, —such as those in the Chicago metropolitan area, —are represented by red circles on yellow-to-red backgrounds adjacent to blue circles on blue backgrounds. The City of Chicago is shaded yellow for revenue, highlighting its large numbers of very high- poverty schools. The leafy suburbs have both very high spending and low-poverty schools. 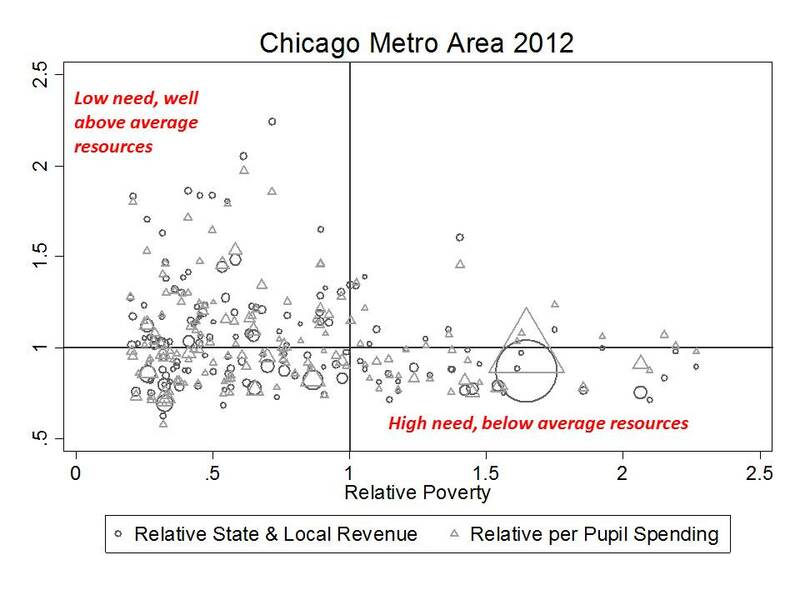 To the south of Chicago are additional, modest to poorly funded districts with very high- poverty schools. 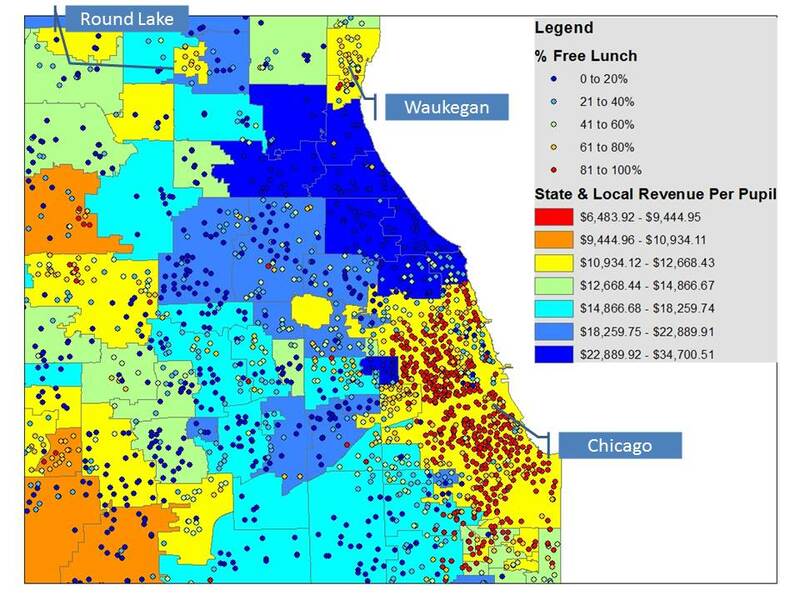 Two additional high-poverty districts with particularly low revenue appear to the north and west—Waukegan and Round Lake. Figure 2 shows that on average in the Chicago metro area, higher poverty districts have lower average combined state and local revenues and current operating expenditures. That is, they are behind overall, having little chance to compete with their surroundings by making simple tradeoffs between class sizes and competitive wages. But I merely speculate right? We all know those greedy Chicago teachers are pulling in a hefty salary and livin’ large, even by comparison to their peers in the leafy ‘burbs, right? Figure 3 pretty quickly dispels that myth. Figure 3 is based on a salary model applied to all certified staff in the entire state of Illinois from 2002 to 2012. Staff salaries were predicted as a function of a) years of experience in Illinois, b) degree level, c) contract months, d) specific teaching or administrative assignment code, and e) labor market where the district is located, for f) all full time school district employees. These factors explain over 70% of the variation in salaries. The remaining variation is then the amount each teacher’s salary varies from the labor market average (metro area) for a teacher with the same experience, degree level, and specific assignment, on a monthly basis. The average difference between the actual and predicted salaries for teachers in any district are an indicator of the relative competitiveness of salaries in their district, to others in the same labor market. I express this average as a ratio of the teacher salaries in each district to the labor market average. 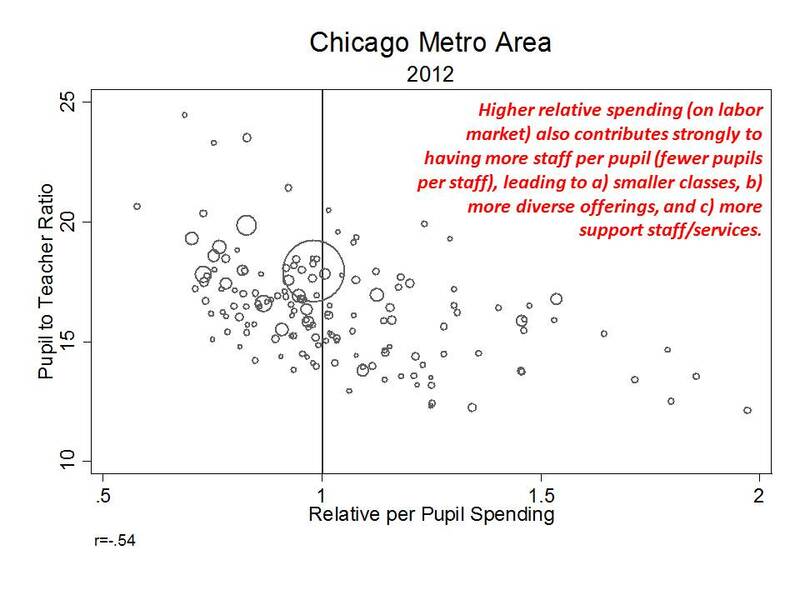 Figure 3 shows the relationship in 2012 between the competitiveness of district teacher salaries and the relative spending levels of districts (relative to labor market average). Of course, the logical response from them reformy-thinkin’ types is that these districts simply need to use their piles of cash lyin’ around to make those salaries more competitive. It must be the case that these districts are simply employing far more staff than they need to per child, compared to the other districts that are outpacing them on salary. It couldn’t possibly be that these districts neither have enough money to employ more staff, or do so at relatively competitive wages. But heck, all of that reasoning only works well in a world where no-one ever looks at real data. Figure 4 shows us what the data look like regarding the relationship between a) relative spending per pupil and b) total staffing per pupil. Shocking revelation – districts with more money can provide more staff. Shocking double revelation combining this evidence with the previous – districts with a lot more money can provide both more staff and more competitive wages. And thus, triple shocking – districts with a lot less money can’t do either! Notably, forthcoming work will (numbers already run) validate that these overall staffing ratio differences do translate to class size differences. 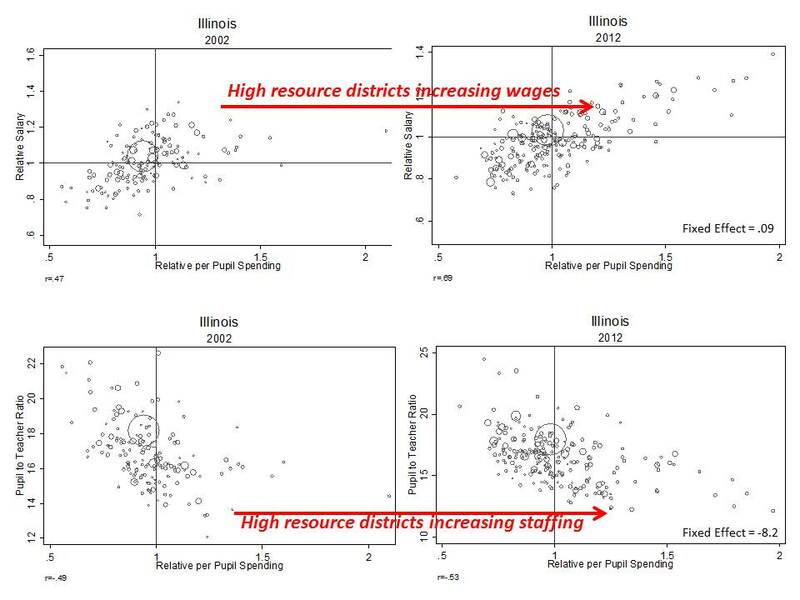 And by the way, the relationships between money and staffing and competitive wages, at least in the Chicago metro are getting stronger over time, specifically as the high spending leafy ‘burbs run away from the pack! Figure 5 – It’s only getting worse over time! You may have noticed that this is my first blog post in a long time. Quite honestly, there are many days when I just feel like I’ve already written all of this stuff, or even if I haven’t, the issue at hand is so plainly obvious that I shouldn’t need to say it. The fact that public discourse over educational equity has actually decayed to a state where teacher quality equity arguments are entirely separable from – completely unrelated to funding equity – and somehow driven instead by uniformly applied due process requirements is just bizarre. It’s nonsensical. We’ve entered a bizarro world I never could have imagined when I started out doing this stuff back in the mid-1990s. And this Bizarro world is being promoted from the supposed highest echelons of our highly stratified society. Harvard Legal theorist/activist Laurence Tribe, for example, seems to believe on the one hand that state’s ought have no constitutional (federal) authority whatsoever to define, operate and regulate (specifically to cap) local property taxation – asserting that local citizens rights to tax themselves as they see fit – to whatever level they choose – is akin to the first amendment freedoms to give unlimited contributions to political campaigns. Surely (cough, cough), there are no equity consequences to this argument. Yet, on the other hand, Tribe has signed on to help craft the next wave of Vergarguments [definition ofVergarguments], claiming that the major barriers to teacher quality equity (which trumps funding equity every time) are state statutory due process and seniority protections. Now, one might reconcile Tribe’s participation in these seemingly disparate cases on the basis that he simply believes state’s ought to have no authority to regulate anything about local public education systems [a notion historically lacking any precedence whatsoever, since these systems, are, well, creations of the states] – property tax revenues or teacher contractual issues. But it’s pretty hard to imagine how the combination of removal of any and all limitations on local property taxation and removal of public employee due process and seniority protections leads us to either a more equitable or adequate system of public schooling. Rather, they lead us down the road to a Mad Max world – a freakin’ everyone-for-themselves free for all. This idiocy – cast as lofty super-intellectual progressivism that us poor common folk simply can’t grasp (kind of like this BS) – has to stop. We are being led down a destructive road to stupid – by arrogant , intellectually bankrupt, philosophically inconsistent, empirically invalid and often downright dumb ideas being swallowed whole and parroted by an increasingly inept media – all, in the end creating a massive ed reform haboob distracting us from the relatively straightforward needs of our public schools. Many of the issues plaguing our current public education system require mundane, logical solutions – or at least first steps. Money matters. Having more helps and yes, having less hurts, especially when those who need the most get the least. Equitable and adequate funding are prerequisite conditions either for an improved status-quo public education system OR for a structurally reformed one. Sufficient, stable state revenue systems are required for supporting equitable and adequate funding. [forthcoming article on this in Ed Policy Analysis Archives] Yeah… that means taxes (even property taxes have their virtues). We need to get out of this mindset that all taxes are always bad. Taxes pay for important stuff. Back to school on this one! & no, our tax burden, even in Jersey is not through the roof. Equitable and adequate funding translates to more equitable wage variation across schools and districts and translates to more equitable and adequate staffing ratios. Yes, it’s true that one might provide more equitable and adequate funding, which might yield more equitable and adequate wages and staffing ratios, but there may still exist inequities in teacher quality distribution. At that point we might begin to identify other factors contributing to that inequity. But equitable and adequate funding is still a prerequisite condition. So let’s drop all of this illogical, convoluted BS and start doing the right thing. I’m sick of half-baked claims that online options are necessarily cheaper and equally or more effective. Seehere, and see HERE for thorough rebuttal. I’m sick of half-baked claims that charter schools have found a cost-less secret sauce. See here, here, andhere… and HERE, HERE and HERE for thorough rebuttal. And finally, see here for a more thorough discussion of research on improving educational productivity and efficiency. [i] Card, D., and Payne, A. A. (2002). School Finance Reform, the Distribution of School Spending, and the Distribution of Student Test Scores. Journal of Public Economics, 83(1), 49-82. [ii] Jackson, C. K., Johnson, R., & Persico, C. (2014). The Effect of School Finance Reforms on the Distribution of Spending, Academic Achievement, and Adult Outcomes (No. w20118). National Bureau of Economic Research. [iii] Figlio (2004) explains that the influence of state school finance reforms on student outcomes is perhaps better measured within states over time, explaining that national studies of the type attempted by Card and Payne confront problems of a) the enormous diversity in the nature of state aid reform plans, and b) the paucity of national level student performance data. Figlio, D. N. (2004) Funding and Accountability: Some Conceptual and Technical Issues in State Aid Reform. In Yinger, J. (Ed.) p. 87-111 Helping Children Left Behind: State Aid and the Pursuit of Educational Equity. MIT Press. [iv] Roy, J. (2011). Impact of school finance reform on resource equalization and academic performance: Evidence from Michigan. Education Finance and Policy, 6(2), 137-167. [v] Papke, L. (2005). The effects of spending on test pass rates: evidence from Michigan. Journal of Public Economics, 89(5-6). 821-839. Hyman, J. (2013). Does Money Matter in the Long Run? Effects of School Spending on Educational Attainment. http://www-personal.umich.edu/~jmhyman/Hyman_JMP.pdf. [vii] Downes, T. A., Zabel, J., and Ansel, D. (2009). Incomplete Grade: Massachusetts Education Reform at 15. Boston, MA. MassINC. [viii] Guryan, J. (2001). Does Money Matter? Estimates from Education Finance Reform in Massachusetts. Working Paper No. 8269. Cambridge, MA: National Bureau of Economic Research. [ix] Nguyen-Hoang, P., & Yinger, J. (2014). Education Finance Reform, Local Behavior, and Student Performance in Massachusetts. Journal of Education Finance, 39(4), 297-322. Downes, T. A. (2004). School Finance Reform and School Quality: Lessons from Vermont. In Yinger, J. (Ed. ), Helping Children Left Behind: State Aid and the Pursuit of Educational Equity. Cambridge, MA: MIT Press. [xi] Indeed, this point is not without some controversy, much of which is readily discarded. Second-hand references to dreadful failures following massive infusions of new funding can often be traced to methodologically inept, anecdotal tales of desegregation litigation in Kansas City, Missouri, or court-ordered financing of urban districts in New Jersey. Baker, B. D., & Welner, K. G. (2011). School finance and courts: Does reform matter, and how can we tell. Teachers College Record, 113(11), 2374-2414. Two reports from Cato Institute are illustrative (Ciotti, 1998, Coate & VanDerHoff, 1999). Ciotti, P. (1998). Money and School Performance: Lessons from the Kansas City Desegregations Experience. Cato Policy Analysis #298. Coate, D. & VanDerHoff, J. (1999). Public School Spending and Student Achievement: The Case of New Jersey. Cato Journal, 19(1), 85-99. Hanushek and Lindseth (2009) provide a similar anecdote-driven approach in which they dedicate a chapter of a book to proving that court-ordered school funding reforms in New Jersey, Wyoming, Kentucky, and Massachusetts resulted in few or no measurable improvements. However, these conclusions are based on little more than a series of graphs of student achievement on the National Assessment of Educational Progress in 1992 and 2007 and an untested assertion that, during that period, each of the four states infused substantial additional funds into public education in response to judicial orders. That is, the authors merely assert that these states experienced large infusions of funding, focused on low income and minority students, within the time period identified. They necessarily assume that, in all other states which serve as a comparison basis, similar changes did not occur. Yet they validate neither assertion. Baker and Welner (2011) explain that Hanushek and Lindseth failed to even measure whether substantive changes had occurred to the level or distribution of school funding as well as when and for how long. In New Jersey, for example, infusion of funding occurred from 1998 to 2003 (or 2005), thus Hanushek and Lindseth’s window includes 6 years on the front end where little change occurred (When?). Kentucky reforms had largely faded by the mid to late 1990s, yet Hanushek and Lindseth measure post reform effects in 2007 (When?). Further, in New Jersey, funding was infused into approximately 30 specific districts, but Hanushek and Lindseth explore overall changes to outcomes among low-income children and minorities using NAEP data, where some of these children attend the districts receiving additional support but many did not (Who?). In short the slipshod comparisons made by Hanushek and Lindseth provide no reasonable basis for asserting either the success or failures of state school finance reforms. Hanushek (2006) goes so far as to title the book “How School Finance Lawsuits Exploit Judges’ Good Intentions and Harm Our Children.” The premise that additional funding for schools often leveraged toward class size reduction, additional course offerings or increased teacher salaries, causes harm to children is, on its face, absurd. And the book which implies as much in its title never once validates that such reforms ever do cause harm. Rather, the title is little more than a manipulative attempt to convince the non-critical spectator who never gets past the book’s cover to fear that school finance reforms might somehow harm children. The book also includes two examples of a type of analysis that occurred with some frequency in the mid-2000s which also had the intent of showing that school funding doesn’t matter. These studies would cherry pick anecdotal information on either or both a) poorly funded schools that have high outcomes or b) well-funded schools that have low outcomes (see Evers & Clopton, 2006, Walberg, 2006). In equally problematic analysis, Neymotin (2010) set out to show that massive court ordered infusions of funding in Kansas following Montoy v. Kansas led to no substantive improvements in student outcomes. However, Neymotin evaluated changes in school funding from 1997 to 2006, but the first additional funding infused following the January 2005 Supreme Court decision occurred in the 2005-06 school year, the end point of Neymotin’s outcome data. Hanushek, E. A. (ed.). (2006). Courting failure: How school finance lawsuits exploit judges’ good intentions and harm our children (No. 551). Hoover Press. Evers, W. M., and Clopton, P. (2006). “High-Spending, Low-Performing School Districts,” in Courting Failure: How School Finance Lawsuits Exploit Judges’ Good Intentions and Harm our Children (Eric A. Hanushek, ed.) (pp. 103-194). Palo Alto, CA: Hoover Press. Walberg, H. (2006) High Poverty, High Performance Schools, Districts and States. in Courting Failure: How School Finance Lawsuits Exploit Judges’ Good Intentions and Harm our Children (Eric A. Hanushek, ed.) (pp. 79-102). Palo Alto, CA: Hoover Press. Greene and Trivitt (2008) present a study in which they claim to show that court ordered school finance reforms let to no substantive improvements in student outcomes. However, the authors test only whether the presence of a court order is associated with changes in outcomes, and never once measure whether substantive school finance reforms followed the court order, but still express the conclusion that court order funding increases had no effect. Greene, J. P. & Trivitt, (2008). Can Judges Improve Academic Achievement? Peabody Journal of Education, 83(2), 224-237. Neymotin, F. (2010) The Relationship between School Funding and Student Achievement in Kansas Public Schools. Journal of Education Finance 36 (1) 88-108. Shanker Institute, 2012), available athttp://www.shankerinstitute.org/images/doesmoneymatter_final.pdf. [xiii] Bruce D. Baker and Preston C. Green III as well as William Koski and Rob Reich explain that to a large extent, education operates as a positional good, whereby the advantages obtained by some necessarily translate to disadvantages for others. For example, Baker and Green explain that, “In a system where children are guaranteed only minimally adequate K–12 education, but where many receive far superior opportunities, those with only minimally adequate education will have limited opportunities in higher education or the workplace.” Bruce D. Baker and Preston C. Green, “Conceptions of Equity and Adequacy in School Finance.” In Helen F. Ladd and Edward B. Fiske, eds., Handbook of Research in Education Finance and Policy (New York: Routledge, 2008), p. 203–221; Koski and Rob Reich, “When “Adequate” Isn’t: The Retreat From Equity in Educational Law and Policy and Why It Matters,” Emory Law Review 56 (3) (2006): 545–618, available athttp://www.law.emory.edu/fileadmin/journals/elj/56/3/Koski___Reich.pdf.